Tarifa Melting Pot Rooftop Hostel & Kite School v Tarifa, Španělsko: Zarezervujte nyní! The entire amount of the bill* will be charged 4 weeks prior to arrival. - 1 week before arrival we do not refund. * excluded the 10% deposit paied to Hostelworld.com. Please note any booking of more than 12 people will be cancelled. 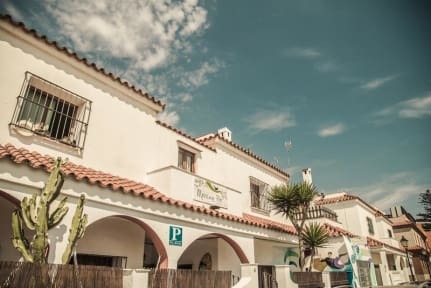 Located in the centre of Tarifa and 1 minute walking from the beach, the hostel is a typical Andalusian chalet, practical and comfortable for the travelers: a large, fully equipped kitchen, a very large living room, computers for guests' use, WI-FI throughout the place, three beautiful terraces overlooking Africa, where you can chill out or sunbath. 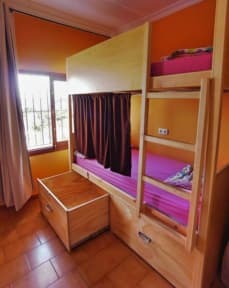 Our dorms, with 4, 6, or 8 beds, are spacious, and we also have twins and doubles for the travellers who prefer more privacy. The beds are all new and comfortable, and each guest has its own individual security locker. We also have hair dryers and reading lights, in case you need them. Cleanliness is a very important issue for us. The bedsheets are included in the price. In addition, we also have free maps of the city, board games, and the best information and recommendations on Tarifa and its surroundings. We collaborate with various companies in town, in order to get our guests the best prices for activities like kite surfing, windsurfing, scuba diving, mountain excursions and horse riding.